Let’s say you are at your kid’s soccer game. What can you do when there is not enough light to shoot good action shots and they are coming out blurry? You can try panning. Panning is a fantastic technique for all kinds of low light shooting situations like rainy days and evening sporting events. You will even be able to get good shots under stadium lights using this shooting technique. 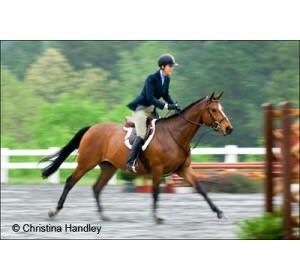 We learned to use this technique during many years of shooting horse shows to save the day when the light was lousy. A horse show is no different than any other outdoor sports event, sometimes it rains and sometimes the event doesn’t get done before dark but everyone still wants a photo. We often found that the panned photos were very popular because they were something different. 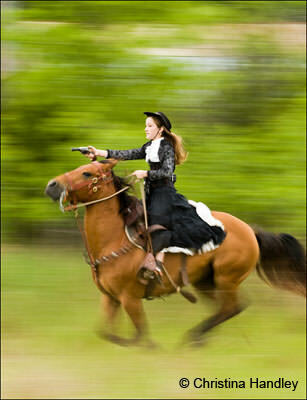 The creative use of motion blur is excellent for creating implied motion. The panning technique is not difficult but it takes a little practice. There are three camera settings you will need to know and a couple camera handling techniques. Here are the three camera settings you need for panning. The easiest exposure mode to use is shutter priority. On a Canon camera this is TV mode on a Nikon camera this is S mode. Once you have your camera on shutter priority exposure mode you will select an appropriate shutter speed. This is going to depend on the speed your subject is traveling. A race car is faster than a kid playing soccer so you will need a little faster shutter speed. Try 1/30th to start with and give 1/15th and 1/60th a try as well. In shutter priority your camera will select the right aperture for a correct exposure. You will also need to set the ISO. Usually ISO 800 or 1600 is going to be a good choice for low light conditions. Set your shutter speed and ISO then look through your camera at your subject and see what aperture reading you are getting. Something between f/4 and f/11 is best. If your aperture is very small like f/22 then lower your ISO. If your aperture is reading Lo in your Nikon or blinking in your Canon camera that is your underexposure warning and you need to increase your ISO. The next camera setting you need is focus mode. On your Canon camera set the focus mode to Servo and on a Nikon camera set the focus mode to Continuous. This setting is designed to track a moving object. Finally, set your motor drive to high speed, burst or multiple. You do not want to leave it on single shot or you will lose focus each time you shoot a photo. If you have it on high speed you can fire off a frame and keep the shutter button partly depressed to continue to track the subject. Here are the camera handling techniques you need to know. When you pan you will follow the subject horizontally with your camera. Imagine you are looking through binoculars watching an eagle fly across the sky. You will smoothly follow the subject just the same way with your camera. Keep your arms at your sides and follow in a smooth, fluid motion. Don’t make any wild swings. To lock and maintain focus you will put the center focus point on the subject and hold the shutter button halfway down. Smoothly follow the subject keeping the shutter button halfway depressed and keeping the center focus point on the subject. You need to fill 50% of frame with your subject while you are shooting. This is essential to maintaining focus. Your camera cannot lock and track focus on a tiny, distant object. The best lens is a zoom telephoto. You really need telephoto to fill the frame sufficiently with your subject. In sports photography, this is a foregone conclusion because it is normally impossible to be physically close to your subject. Yes, when you shoot this way the subject will be centered in the frame. You can crop a little in post processing to tweak the composition. You can’t shoot a subject moving towards the camera. The subject must be moving across the frame from one side to the other parallel to you. Don’t try to pan subjects that are coming towards you. If you have a Canon IS lens turn the IS on and use mode 2 (vertical stabilization only). If you have a Nikon VR lens turn the VR on and use Normal. (Nikon VR has automatic panning detection.) IS/VR stabilizes the vertical motion. If you don’t have IS or VR on your lens, don’t worry about it. It will be okay. Embrace motion blur. Do not stress about sharpness. The amount and type of blur is going to depend on your subject. Things with wheels (cars, bikes, ATVs, etc) move in a steadier horizontal path than things with legs (people, dogs, horses, etc). Some photographers like completely blurry impressionistic images while others like a hint of definition. Keep an open mind. Panning is a low percentage shot especially at first. You will only have a few keepers. Shoot lots and delete. Panning is good for lots more than low light situations. 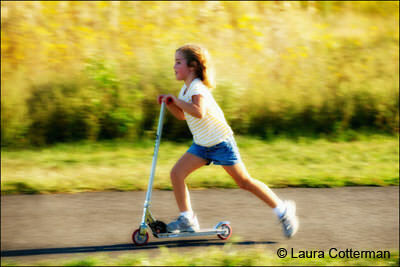 Using panning to create motion blur is a fantastic creative effect. You can imply motion and make beautifully colorful streaked backgrounds out of a very busy scene. Laura Cotterman is a teacher at www.LearnToTakePhotos.com. We specialize in online classes for adult learners. We have taught thousands of people what all those controls, dials and settings on their camera are for. Our courses explain f/stops, shutter speeds, ISO and lots more. Our courses begin with all the basics for getting off Auto modes and understanding how to take more creative photographs with your DSLR camera. 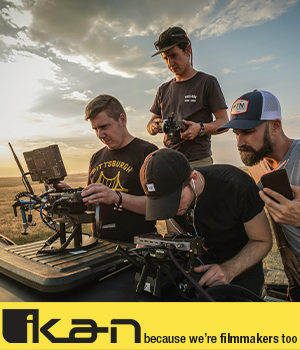 We have classes suitable for beginners or anyone else that wants to learn more about camera controls and techniques. Our classes are affordable and easy to commit to with a short course format. Everything is online and accessible 24/7 and you will have a professional photographer to personally guide you every step of the way.